We’ve tested dozens of walkie-talkies and looked at features such as range, battery life, sound quality and weight. We think these two are the best of the bunch. 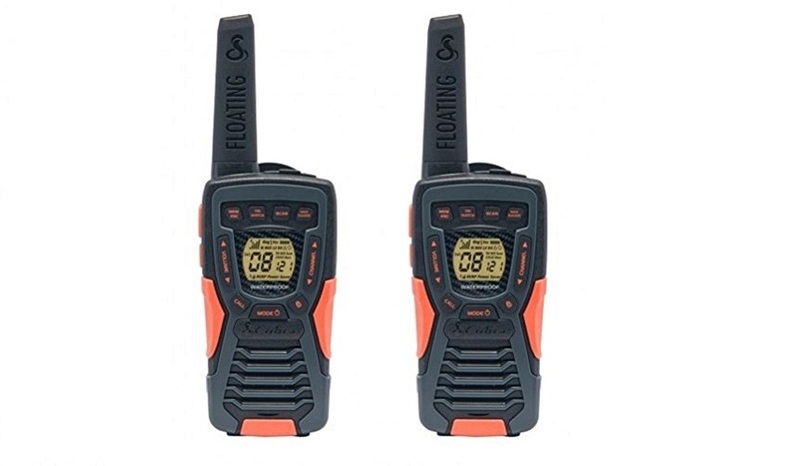 Continue reading to see all of our top six handheld two-way radios. The Motorola T80 is our editor’s top pick and for good reason. This device is priced at the mid-range point but is built robustly and contains enough features to match many more expensive models. It has a grerat battery life, is lightweight and easy to use. Currently priced at less than £30, we think the Retevis RT24 walkie talkie is the best of the budget range devices. It contains all the basic features you would expect and has a good range. 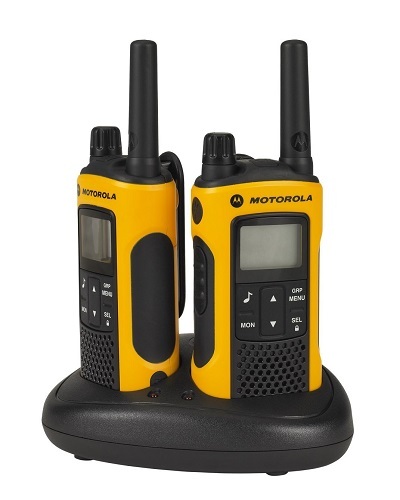 This walkie talkie is perfect for occasional use, such as hiking, skiing and trekking. Walkie talkies can be used in a variety of different locations, from building sites to the mountains. They are perfect for areas where there’s no mobile phone signal or you need to make lots of short calls. You should consider carefully the environment the device will be used in. Not everyone needs a windproof, waterproof and shockproof device. There are also range, frequency and battery life considerations. The products we tested were for amateur use and typically have a range of up to ten miles. If you would like a device with more power, you’ll probably need to buy a licensed walkie-talkie which is designed for professional use, licenses are approved by Ofcom – the UK’s communications regulator. 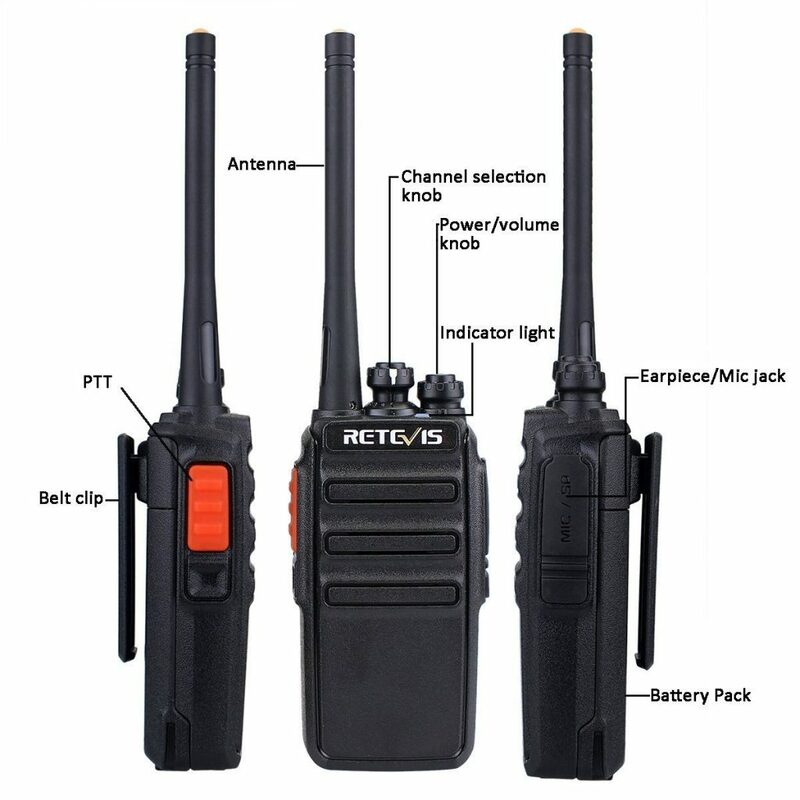 The longer the range, the further apart the users can be located but this often comes at a price with cost, weight and size of the device increasing with more powerful walkie talkies. If you want to use the device outdoors look for splash-proof products, if you will use it near water, perhaps on a boat or kayak, consider a fully fledged waterproof unit instead. The weight of the product is important if you’re using the device when cycling, hiking or climbing. It’s not a key consideration if you’re using the device from a fixed location such as an office. If you’re using the walkie-talkie for extended activities such as wild camping or trekking, you should consider the size of the battery and how long it lasts between charges. Ofcom limits the channel frequency you can use but different devices will have a different number of available channels. Also look out for a locking feature if you don’t want others to gain access to the walkie-talkie. Look out for this icon, we’ll display the guarantee period for all the devices. As with all electronics, the longer the guarantee period, the better. Here are our top six walkie-talkies, chosen independently by the team here at Gifted Geek. We think these products are great and strike the right balance between cost, features and robustness. Don’t forget; none of these walkie talkies needs a licence, they all have a limited range and power output which is determined by Ofcom, the UK’s communications regulator. If you’re heading out for a day in the great outdoors, then it’s best not to rely on mobile phones. Problems with battery or coverage can transform your mountain hike into a disaster. 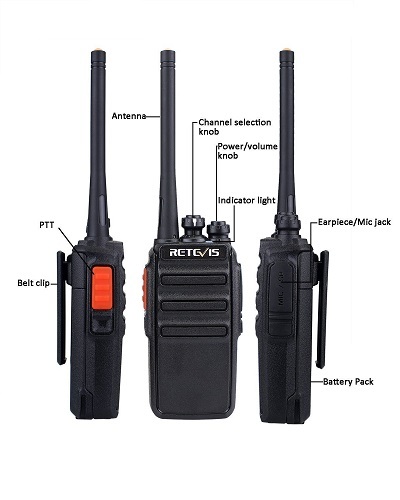 A classic walkie talkie, on the other hand, is designed exactly for this scenario, and is a great way of ensuring that you and your friends can stay in contact with each other. The eSynic walkie talkie has a range of up to 5 kilometres, and is powered by a rechargeable li-ion battery. The long-life, 1500mah battery will warn you well in advance when it needs changing, so you won’t have any unpleasant surprises while out and about. There’s also a power-saving mode if you find yourself in a situation where you need to conserve the battery as long as possible. If your trip is going to extend past daylight hours, this walkie talkie comes with a handy LED light that functions as a torch once the sun goes down. As well as the two handsets, the eSynic also includes earpieces, USB battery chargers, belt clips and slings for ease of transportation. The Motorola T92 is the most robust walkie talkie we looked at. Its thick protective case is both shockproof and waterproof to one metre. One neat feature that makes this device stand out above the rest is how it floats on water. This is perfect for kayakers, boaters or anyone who works or plays near water. The walkie talkie’s lights will automatically activate upon contact with water, so you’ll find it easy to locate the device, even at night. 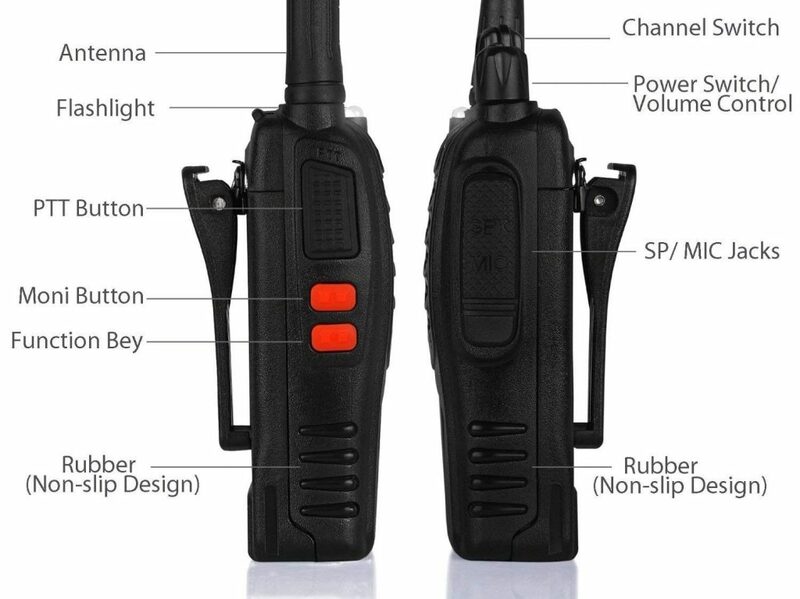 This walkie talkie has a good range of about 10k and doesn’t require a licence. 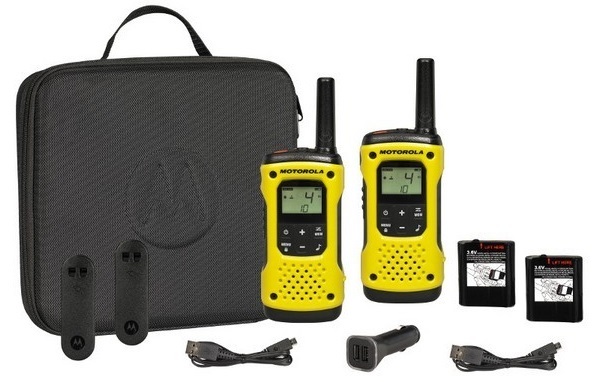 If you’re looking for an outdoor walkie-talkie with robustness, we recommend the Motorola T92. The Retevis RT24 is at the lower end of the budget range and is perfect for occasional use. Priced at less than £30 we couldn’t find a better product at or near to this price. The sound quality and range migh not be the best, but for occasional, amateur use, we think this product is the best of the budget range. While the Kenwood TK 3401D lacks some features found on rival devices such as a flashlight, SOS function and vibrating feature, it’s made robustly and is designed for intensive daily use. This walkie talkie has 16 analogue channels and 16 digital channels to choose from and you don’t need a licence to use this device in the UK. 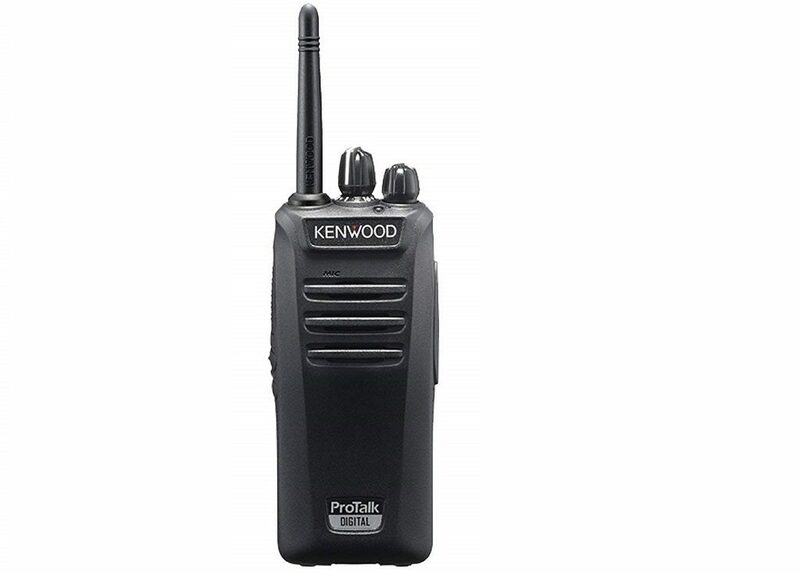 Kenwood have a superb reputation for building industrial strength walkie talkies that can be used constantly for years. The TK3401D replaces the successful TK3301 model. For a sophisticated walkie talkie that can’t be beaten, the Cobra AM 1035 is a great choice. Perfect for trekking or hiking holidays, it comes with a range of up to 12 kilometres, making staying in contact with your companions an absolute breeze. Even a technophobe will have no problems using the AM 1035. It uses voice activation technology to transmit, allowing you to send messages hands-free, and offers up to 10 different call alerts for incoming calls, as well as a vibrating alert. The long-life, rechargeable batteries will keep going even longer thanks to a battery saver mode, which is activated if there are no transmissions within 10 seconds. The AM 1035 is suitable for all terrain, and can even be submerged in water, to a depth of 1m for up to 30 minutes. It also has a built-in LED torch, which will prove useful if you need to use it after dark. This is a modern walkie talkie that will happily meet all your needs, ideal for any long trips outdoors where a mobile phone just won’t stand up to the challenge! The Motorola T80 is an excellent all-rounder with good quality sound, a decent range which is comparable to more expensive models and has a long battery life at around 8 hours. This device is robust and waterproof enough to meet the needs of the average user outdoors and is also reasonably priced. The only thing we didn’t like about this walkie-talkie was the long charging time required – around 14 hours. The Motorola T80 is our editor’s top pick. The manufacturer’s stated range is usually measured over an unobstructed distance, that means from hilltop to hilltop but if you use the walkie-talkie in a built-up area, expect the range to be much less. Most of the licence-free devices we looked at had a good range of up to 10k provided there was a clear line of sight. This reduced to between 1k and 3k in built-up areas. As a general rule of thumb, noise reduction and features designed to improve sound quality come at a price and this is usually a reduced overall range. All of the devices listed on this page are PMR446 compatible, this means they transmit messages on the 446mHz range which is free for personal and business use. PMR stands for Personal Mobile Radio and the frequency is free to use throughout Europe.